Content, Copy or Digital Copywriting? Guest blogger Lesley Zheng worked with me to make it easy for all those of you that haven't worked with a copywriter or content writer before by outlining some simple distinctions in how content, copy and digital copywriting differ. Thank you Lesley for your hard work! The digital space is a business’ most powerful tool when used correctly. It is important to understand the differences between content writing and copywriting. But when it comes to digital copywriting, which is another level up again, many become confused or stumble along the way. The essence of content writing is copy that has been written to market a brand, product and or service. The art of writing content will vary between media due to the audience, tone of voice used and style. Defined as “things that are held or included in something”, content is the words (spoken or written) in an article or video. The next step in content is knowing your customer; it is more effective for you to generate content that is of interest and asking someone to engage with you than to just speak about something random. For your content to be successful, this kind of content is called copywriting or ‘general copywriting’. The difference between general copywriting and content writing is the purpose of the work. A good place to start is to ask yourself; what am I trying to achieve? The definition of copywriting is “wording designed to persuade or influence someone”. By answering the question above, you have won part of the battle already. Copywriting is the vehicle that you use to make a connection between you and your customer. General copywriting will allow for a business to effectively attract customer attention. It includes content organised to best represent your business and its values, hopefully it will go further and solve a problem and ask the client to take action to get their solution from you! General copywriting is more often found in the form of radio and print advertisement. The history of copywriting is fairly formulaic. Because of this, it can be generic and lack personality. What is digital copywriting and what can it do for you? Digital copywriting is general copywriting re-imaged for the digital space. The main difference between digital and general copywriting is SEO copy. SEO, or search engine optimisation, refers to the process or action of writing content recognised by search engines (i.e. Google, Yahoo). We use SEO copy to rank higher in organic searches, thus more visibility and traffic. Digital copywriting helps you make money in two ways. Better conversion rates and better search engine performance. When we refer to the conversion rate, we are referring to the traffic created by your customer usage. We can improve search engine performance by including SEO copy in our digital copy. The second key to a digital copywriter is their interest in having that content link to other media in such a way as to enhance the visibility of your brand and increase engagement. This method will achieve longer lasting results compared to general copywriting. But it often requires more work due to the frequent changes in the interface and user preference. In saying that, it is often preferred due to being more personalised and more visible, and so is a rising trend in users and a hugely important requirement for businesses that seek to get found online. Digital copywriting appears in the form of blogs, digital advertising and social media posts. Another key factor is the effectiveness of the ‘call to action’. Content focuses on education, copywriting usually has a request for the sale, and digital copywriting refines that call to action by considering functionality at the highest levels. This means a digital copywriter is thinking about where the content appears, how it links to other platforms such as social media or lead pages or mailing platforms. So the call to action moves from being an email address or phone number into clickable links, downloadable products, and nurture stream entry points. What’s the difference between content, copy and digital copywriting? There is no denying the differences between the three in regard to what and how it is written. What many will stumble on is the relationship between the three when writing for the web. Content is the representative for your business, whereas general copywriting may be the request for action in words. 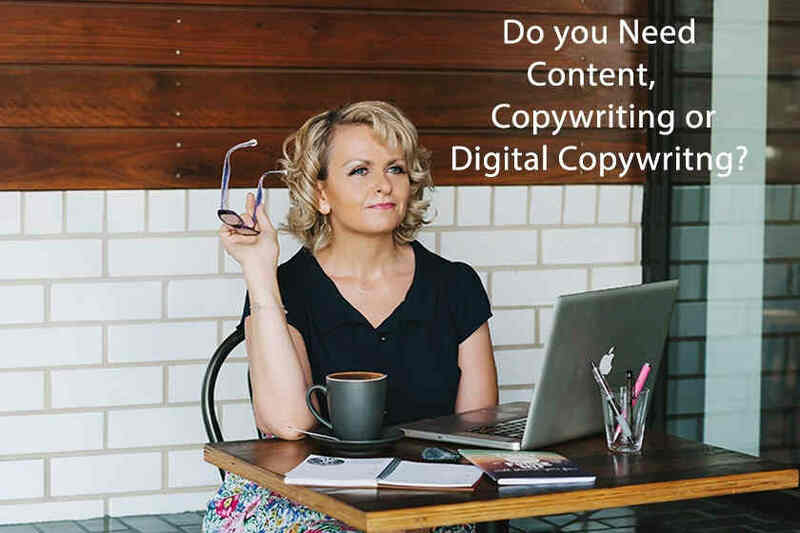 Digital copywriting is the space where content writing and general copywriting are taken to a new level of engagement, interaction and in getting your content found more often. BusinessDictionary.com﻿. (2017). What are sales? definition and meaning. Content Equals Money. (2017). Copywriting v. Web Content: The Difference & Why It Matters. Flannery, D. (2017). Copywriters FAQs - The Definitive Guide to Working With Copywriters. Lloyd-Martin, H. (2017). What Is SEO Copywriting and Why Is It Important?. Robinson, D. (2017). What is SEO? Here's A Simple Plain English Answer, SEO in a Nutshell. The Content Strategist. (2017). Infographic: How Millennials, Gen Xers, and Boomers Consume Content Differently. Previous Post The Three Top Online Success Hacks Next Post What is Search Engine Optimisation?